That's me in the photo 28 years ago. I was 40 years old and had just started going out among the civilians. Damn – I looked pretty good back then! My eyebrows need shaping and I don't know about the blue eyeshadow, but overall, my presentation was pretty good for a novice femulator. I even painted my nails, which is something I have not done in a long time since discovering stick-on nails. 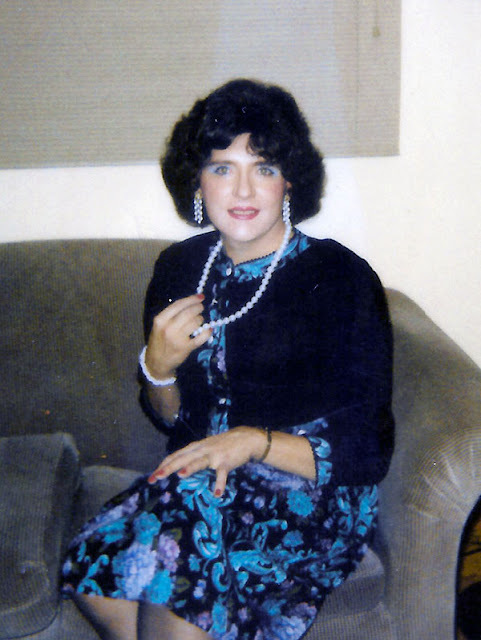 Although I was out of the closet, I was not really out among the civilians that much because I was sure my height (5-ft 14-in) would be a deal breaker and every citizen in the State of Connecticut would know I was a man in a dress. But looking at my photos from that era, I realize I was wrong; I was passable and could have been a contender. You look amazing! I remember my first time out, I was so inept I didn't have a wig or even shave my legs. Pretty lady; love the dress and skirt length. I was in my late 50's before I could dress as well as you. It's a shame that back then more people didn't know that the number of tall women were more than expected. You look fantastic in that photo and could have passed as cis with no problem. Yesterday we saw a photo of a lovely young woman 35 1/2 years ago and today we're seeing that same woman 7 years later, every bit as feminine as she was in 1983.Where was she hiding all those years? Why was she hiding at all? Were you and your wife working on your "look"? Seriously, you don't look like you're "passing", you look like a woman. Consider yourself one of the very fortunate of us who has that ability. And by then the effects of thew Title IX law had been absorbed by society and those tall women, especially the athletes, were walking around tall and proud. A tall woman like yourself wasn't really "sticking out" as much as you imagined. Hell, in the 1980's the "Mike" part of me went out with two 6' women, one cis and one tg. Both loved to wear heels -- 4-5" for the cis woman -- and I didn't give it a second thought. The t-woman had the same trepidation as you back in the early '80's but she was a "looker", like yourself, and quickly got over it. And me? I was just enjoying being with women all those other guys wished they were with! Great photo! You looked perfect!